Dana Bryant, an instructional technologist with Teaching & Learning Technologies, leads faculty members through a Canvas class in the Woodruff Library. Photo courtesy Emory Libraries and Information Technology (LITS). Online training: Training guides, instructional videos and other resources are available at the team’s Training & Resources website. In-person classes: Faculty can take Canvas 101, Canvas Assignments, Migrating Courses, even Graphic Design Tips and Tricks for those who want to go a step further. Sign up for classes, held in the Woodruff Library, at the Canvas training calendar page. Individual session: Those who have specific questions can schedule a one-on-one appointment with a Canvas team member or send an email to classes@emory.edu to set up a session. Department session: The Canvas team can meet with departments to give an overview or provide desk-style assistance; see the Canvas training webpage for more details or email classes@emory.edu for questions about training options not already offered. Emory’s Canvas transition team, charged with helping faculty convert from Blackboard to the Canvas learning management system, is gearing up for another wave of classes and individual sessions in the spring. “Now is a good time to think about when you’re going to move over to Canvas,” says Lee Clontz, head of the Canvas transition team and manager of teaching and learning technologies in Emory Libraries and Information Technology Services (LITS). The team has been leading a full slate of Canvas classes for faculty in the Woodruff Library. The classes will continue into summer 2017. Faculty can visit Emory’s Canvas webpage to view the classes calendar or to schedule an individual appointment. 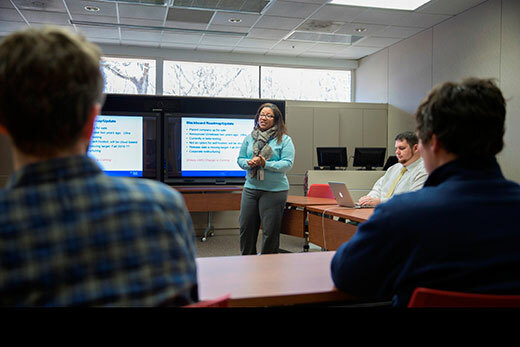 In additional to classes, workshops and consultations, the transition team will provide customized training and workshops for departments that request them. Faculty can use either Blackboard or Canvas to teach courses in the spring, but course shells will be created only in Canvas starting in summer 2017. The university’s contract with Blackboard expires Aug. 31, 2017, and at that point, the old system will be inaccessible. Candler School of Theology has one of the highest Canvas conversion rates at Emory — faculty have moved 60 percent of the school’s courses into the new system. Russell, who moved over all of Candler’s online courses, helps the faculty transfer their courses from Blackboard to Canvas. “We have had really positive feedback from our faculty,” Russell says. “The only negative comments are from people who are dreading the move.” The Canvas team will visit Candler’s December faculty meeting to answer questions and provide individual help if needed. Sheila Tefft, a senior lecturer in the English department's writing program, tested one course with students in the Canvas pilot program during the fall 2015 and spring 2016 semesters. She is running two classes in Canvas this semester and plans to have all of her courses moved from Blackboard in the spring. Canvas has several features she appreciates, such as the peer editing function. With this capability, Tefft can pair off students to read and comment on each other’s work in Canvas, and she can read those comments as well. “Before Emory adopted Canvas, I was using Google Docs to do something similar, and it wasn’t working as smoothly,” Tefft says. Russell also praises the new system.